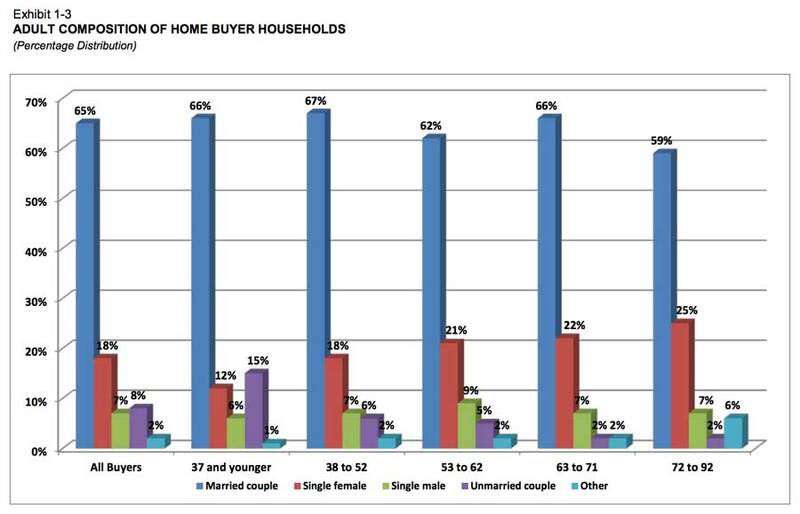 Tips and ideas for how to target multigenerational home buyers in your marketing. 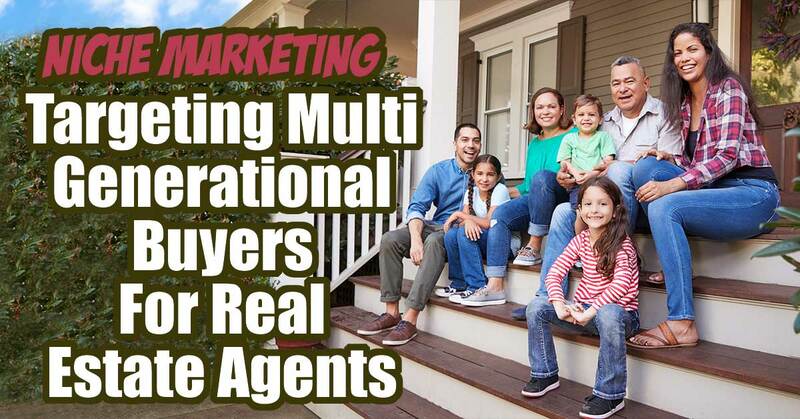 If you are a real estate agent who loves to pick a niche, this is a super interesting group of people to focus on as they are one of the fastest growing groups of buyers! Multigenerational households are a growing trend in the US right now and real estate agents can capitalize on this for sales using Customer Demographics data like age, race, religion, geographic location and finances. Many adults right now are in that “sandwich generation” where they are caring for aging parents as well as raising children or taking care of young adult offspring who can’t afford to move out on their own. While many of the things we are talking about today will apply to buyer’s agents and their clients, it is important to look at them through the lens of helping your clients sell for the most money. As they are listing their homes, it might be worth it to recommend adding a door to make a additional “suite” area rather than paying to upgrade an outdated bathroom or kitchen. Use all of the fields in the MLS that are relevant for “features” that these families may be looking for AND make sure to include them in your descriptions. For example, instead of saying it could be good for an “office” say it could be good for a “office or mother in law suite”. Okay, let’s start right off the bat and talk about why it might be a good idea to make multigenerational households your niche! First off, homes that can house that many people are generally larger and more costly. This could result in higher commissions for you. Secondly, any time you can become the “go to” real estate agent for a defined group of people, you can more easily and affordably market to them. Lastly, many times these types of niches talk among themselves and your referral income could become a backbone of your business. Who Are Buying These Homes? According to the statistics cited above from NAR, one in five buyers aged 53 to 62 purchased a multi-generational home … 20%! That is HUGE! The great news is that you can do a lot marketing-wise to attract that exact type of buyer! 1. Use “mature” people in your postcards and flyers. 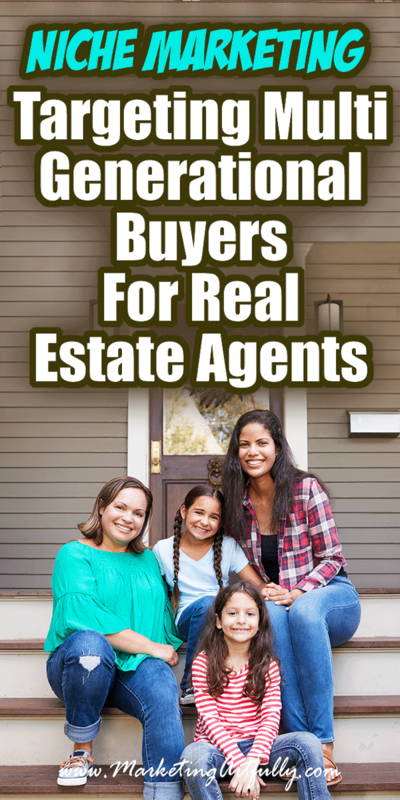 Many real estate agents like to use pictures of young couples or families in their marketing materials, which actually target first time homebuyers rather that middle aged, move up or over buyers. 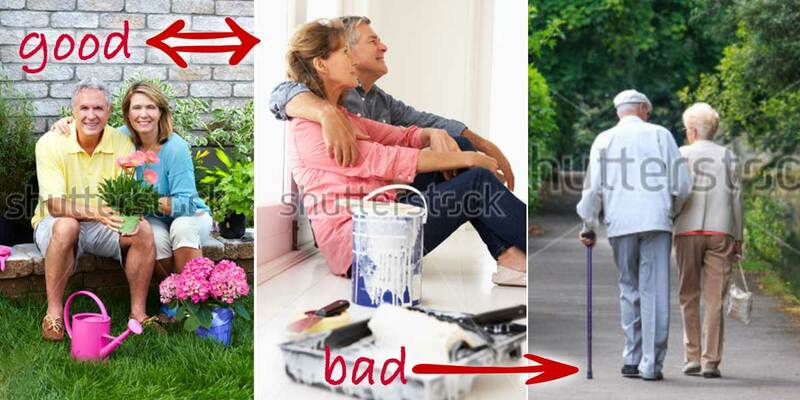 Make sure you are targeting “mature fun” images rather than “old decrepit” images. No one thinks they look as old as they do an you are trying to get business, not offend future clients! Since we only want to find people who want to MOVE to an intergenerational house, we will want to target neighborhoods that are currently good for families, good schools, etc. You could use verbiage that speaks to their pain points. Is it time to think about moving your Mom or Dad in with you? The nice thin g about this tactic is that you could double dip the sale, selling their okay old house and finding them a larger, more accommodating new house. Every Door Direct would be good for this as you are functionally doing blind mailings to a neighborhood. Instead of knowing WHICH people might be in this situation, you would want to use your marketing dollars to find out who might be considering this kind of move! 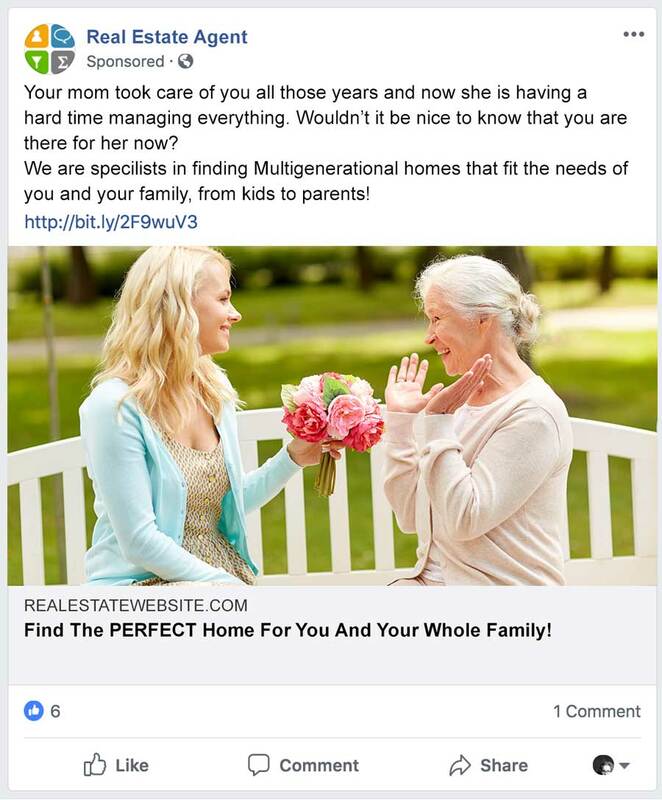 With the magic of Facebook targeting you can pick only people that are in your perfect customer demographic for buying a multigenerational house. You can hone in very affordably on a segment of the population that would be likely to be looking for a multigenerational home! One last demographic to think about is targeting women. Statistically women make 80% of the buying decisions for the home and (I feel) would be more likely to be a driving force behind getting all the people she has to care for under one roof. What Home Features Are They Looking For? Okay, let’s talk about what kinds of home features these buyers might be looking for! While you once may have thought this kind of property was only for the investment agents, that additional living space can easily accommodate a parent or grown child, with the benefit of providing income later should they move out. This is a wholly contained area in the home that could include a bedroom, living area and even a small kitchen area. If there is not one there currently you might discuss the possibly of adding one in at a later time. This is becoming more and more a feature of new home builds. If you have a list of potential intergenerational buyers you might contact a local builder and see if they have that feature in their homes. If so, you may be able to negotiate a higher commission or additional free features for your buyers. If you are having an elderly parent move in, a ground floor master bedroom is almost a must have. This could also be a nice feature if an older child is living with them and comes and goes at all hours. Always nice to have for the privacy of the person moving in with you. An older child might not want to have his/her parents knowing all their comings and goings. There are many accommodations that can be made for elderly people. Grab bars and non-slip flooring are just a couple that come to mind. Whew, that was a LOT to think about, but I wanted to talk just a little briefly about ways you could show your expertise in this area. Make sure you are previewing or attending all the brokers opens for homes that might be good for intergenerational living. Set up a hot sheet notification for every home with a rental unit, income or two masters. Being the most knowledgable agent in the area about these types of properties will get you way ahead of your competition! You should also let them know of your expertise in closing on multiple properties, including financing opportunities. You may have as many as 3 properties in the mix at any one time (the old house, the new house and the parent’s old house). Last but not least, make sure you make connections with people who can help your clients before, during and after the move. 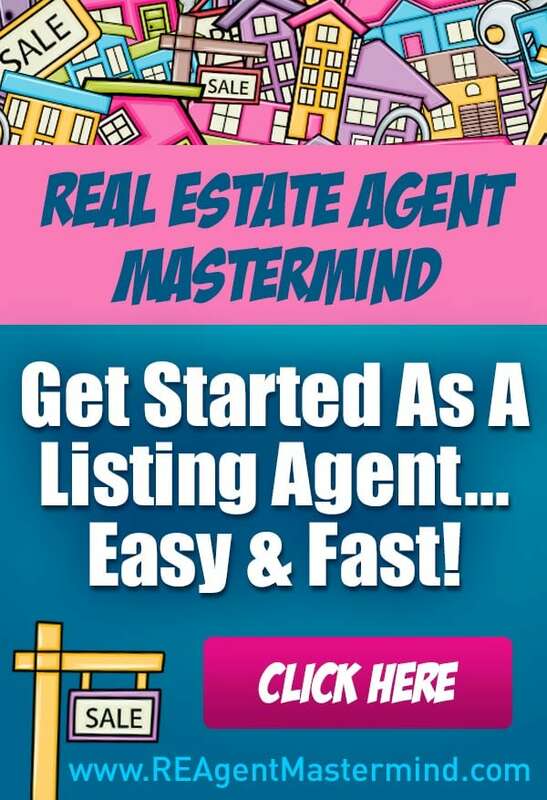 You could make up a list that you give out in your buyers packet! Also, these types of professionals may be able to give you referrals if they hear about people looking to have their parent or child move in with them!